The First Aid at Work training course is designed to enable people designated as a First Aider to carry out appropriate first aid in an emergency situation at work. At the end of the course the candidate will be able to manage a casualty who is injured at work, or suffers from a serious illness, while waiting for more qualified medical help to arrive. Candidates will also have knowledge of the legal requirement of First Aid at Work, be able to undertake simple record keeping and maintain simple records of treatment, accident reporting (RIDDOR), and know the contents of first aid boxes (what they should contain and want they should not contain). The course is designed to meet the requirements of the Health and Safety (First Aid) Regulations 1981. 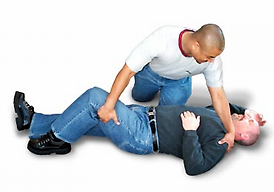 The initial First Aid at Work Training Course is 18 hours over 3 days as required by HSE. If you hold a First Aid at Work certificate then the requalification course is 12 hours over 2 days as required by HSE. If the full course contact time is not completed we may not be able to issue the First Aid at Work Certificate. For students to be to fulfil the role of a First Aider as required by the Health and Safety (First Aid) Regulations 1981. The student should be able to Look after the first aid arrangements within the workplace/area, activate the Emergency Services and administer basic Emergency First Aid. All instructors and assessors satisfy the criteria issued by the Health and Safety Executive (HSE). It is a requirement of the HSE that they keep their training and assessing skills up to date. The instructor will monitor candidates’ performances during the course by ongoing assessment. Certificates are valid for three years from the date of issue. Research has shown that following training, the practical skills of first-aiders can deteriorate. From 1st October 2009, HSE has introduced a strong recommendation that first-aiders undertake annual refresher training during any First Aid at work certification period. Although not mandatory, this will help qualified first-aiders maintain their basic skills and keep up to date with any changes to first aid procedures.